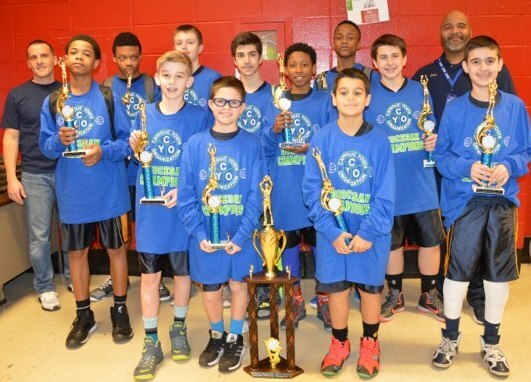 A HUGE congratulations to Coaches Bonavita and Blackman and the St. Anastasia 7th Grade Boys Basketball team. They are the 2015 champions of CYO Brooklyn/Queens Dioceses!!! The parish is so proud of them. After a long season in the most competitive division of their level, a 51 team playoff bracket in the 7th grade division began in late February. In the early rounds, St. A’s rolled off victories against Our Lady of Lourdes, Our Lady of Mercy, and Our Lady of Blessed Sacrament. In the semi-finals they faced their arch rivals in St. Kevin’s. St. Anastasia fell behind early but came back to move on to the finals. In the finals, they faced last year’s finalist St. Francis de Sales. This very tough and disciplined team from the Rockaways jumped out to an early lead. However, St. A’s made the proper defensive adjustments and exploited de Sales weaknesses to even the score. After a nail-biting 4th quarter with the teams exchanging baskets, de Sales hit 2 key free throws with 1.7 seconds left to send the game into overtime. St. A’s was down 2 players because of foul trouble but the speed, athleticism and heart of the team was too much for the tired de Sales team to handle. St. A’s was put at the foul line 3 times in the last 58 seconds of the game and was clutch in making their free throws. St. Anastasia pulled out a 45-39 victory to become champions!!! The team dedicated their championship to William T. Smith Jr, father and close family member of the team.